pixels2Pages | Welcome to the Color Pop Crop! 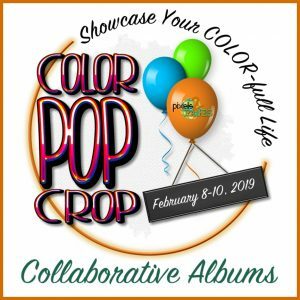 Welcome to the Color Pop Crop! Do you want to know the best way to enjoy a crop? It’s with a pixels2Pages membership! We welcome everyone who loves photos to take part in pixels2Pages’ virtual crops, but when you become a member, you gain access to so much more. This month, through February 13, 2019, we have a special membership promotion. When you purchase a pixels2Pages yearly membership you, will receive a $30 coupon code to be used on any pixels2Pages-branded digital art kits. In addition to Blueprints and Blueprint Books, the pixels2Pages team has added kits with papers, embellishments, shapes, edges, and corners to the store, so you can spend your $30 on a wide variety of kits. 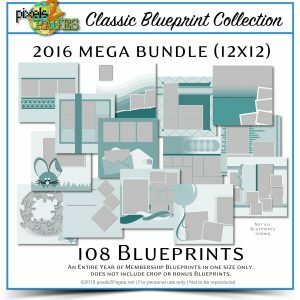 Also, today (February 8, 2019) our 2016 Classic Blueprints Mega Bundles are in the store. 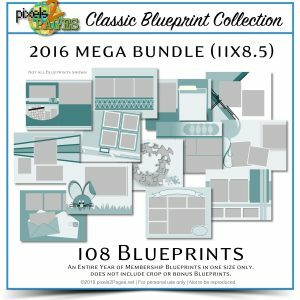 The Mega Bundles are available in both 12×12″ and 11×8.5″ sizes and each one contains 108 Blueprints. The kits are currently the Deal of the Day and can be purchased for $35!! What a deal! 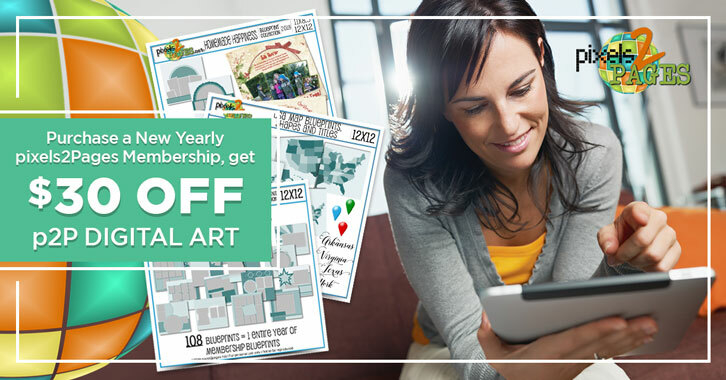 With a new yearly membership, you can use your coupon to get these Blueprints for just $5. That’s right, 108 Blueprints for $5! 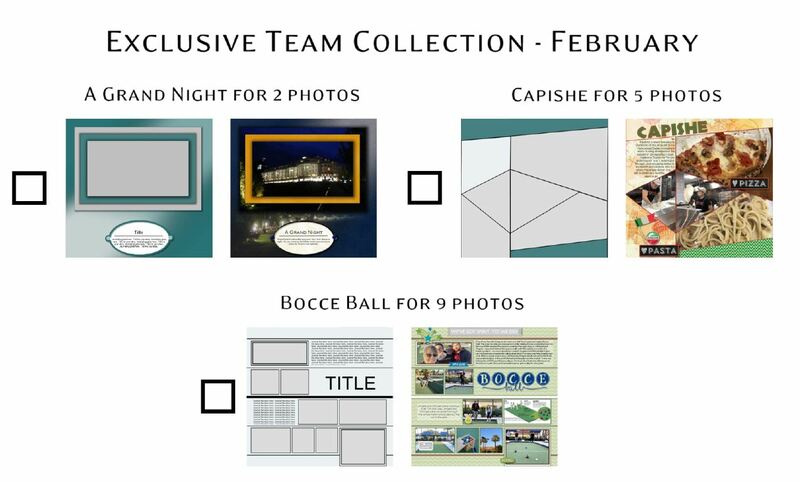 CLICK HERE to see all of the Blueprints that are available in this mega bundle. 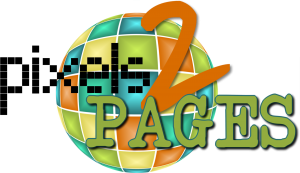 CLICK HERE, or on the pixels2Pages logo to join today. Don’t forget to use promo code DEALOFTHEDAY when you check out on February 8, 2019 (and until 10 AM Eastern Time US on February 9, 2019) to get the mega bundles at a 50% savings. Click the images below for a closer view of the kits. We make it super easy for you to know when a crop offering will post by creating an interactive agenda. The interactive agenda is complete with links that activate at the time the offering is released. 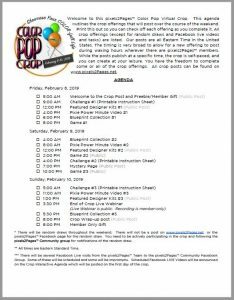 No need to search for the latest crop offering, just click the image below to go to the agenda and then keep the link handy. FOREVER Collaborative Albums are a great way to share your pages. During the crop, the entire pixels2Pages community is engaged and sharing in the pixels2Pages Community Facebook group. 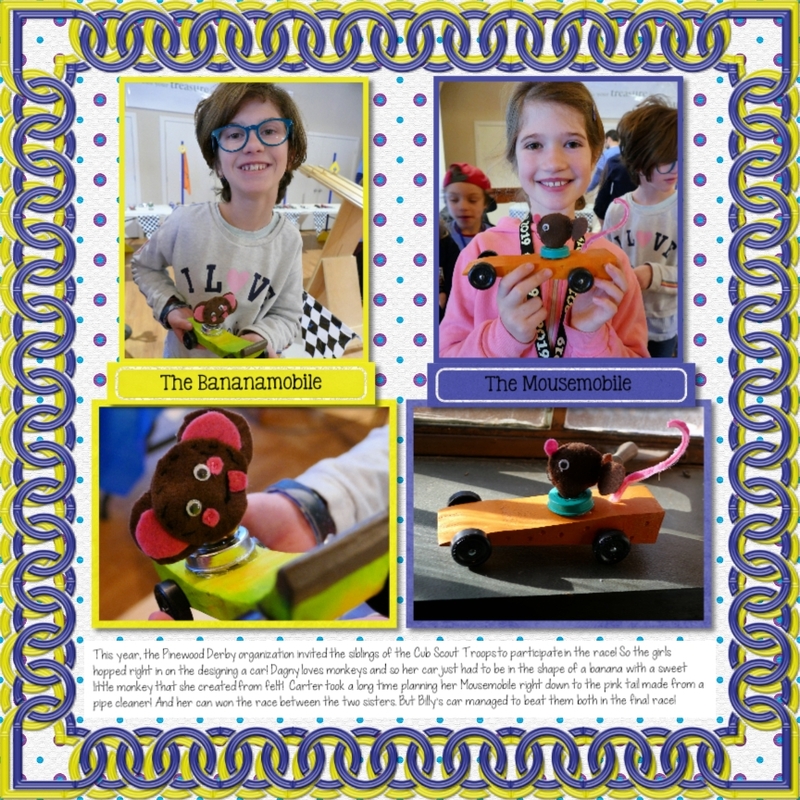 We encourage you to visit, share your creations, and comment on other people’s creations. We also encourage you to share your pages in our FOREVER Collaborative albums. The collaborative albums allow you to share and view sample pages in an organized way. Even if you share to our Facebook group, we encourage you to add your pages to the collaborative album as well. This is also a great way for those of you who are not on Facebook to see pages and share your pages. CLICK HERE or the image below to access the collaborative album for this virtual crop. Save your page to your desktop. Right click the image, go to properties and then go to details. Type your credits in the Comments section then click OK. You can now upload your image to the Collaborative album by clicking the green upload button shown in the image below. p2P Members click HERE to see a tip that details this method of adding information to your image. Upload your image to your FOREVER account. Edit the details in your account. Then click the link to our collaborative album. Click the “Add From Library” button to bring a copy of the image with credits from your FOREVER Account into the Collaborative Album. Please note that any pages posted in our Collaborative albums may be used in pixels2Pages Galleries, social media pages and Pages magazine. Once you have visited our collaborative album once, it is easy to revisit the collaborative album time and time again right from your FOREVER Account. Click on the Albums tab and there will be an “Shared Albums I’ve Visited” link. Click the link and you will see the Collaborative Album. We are trying something new time – we are making ALL badges available at the start of the crop. You will still see helpful links to the badges on each offering, but we thought this may make it easy for you to select what you need when you need it. In the past we did not release all of the badges because we wanted to have an element of surprise; however, we heard many requests to have badges in advance and all in one place. You are still on the honor system for badge collection – please download and use only the badges you earn. Click the image below to access all of the badges for this crop. You can select multiple badges or choose them one at a time to download or copy to your FOREVER library. [NOTE: if you download multiple images at once, they will download in a zipped folder.] At the end of the crop, we encourage you to create a page showcasing your accomplishments. If you prefer not to create a page, you can create a FOREVER Album, add the badges you earned to it. See instructions below to share your badge album. Everyone who earns 20 or more badges and submits a badge page or shares a badge album will earn an exclusive Blueprint. We have a new process for badge page submissions. You must follow this process to claim and receive your Blueprint. or you can click your Badge page that is posted in the pixels2Pages Community Facebook Group. Once the badge page is opened on your screen, copy the browser URL. Once you have the link, CLICK HERE to submit a link to your badge album/page. This is the only way you will receive your bonus Blueprints. Blueprints will be sent out once per day starting February 11, 2019. We work on the honor system at pixels2Pages. You do not need to post every page that you create, but please do not collect badges that you have not earned. The Bingo Card Template is a great resource that can get you motivated to try new things and complete more pages, so we are giving you the Bingo Card template at the beginning of the crop. Spell PIXIE by filling any horizontal row. Spell MAGIC by filling any vertical column or spell PIXIE MAGIC by filling any diagonal rows. 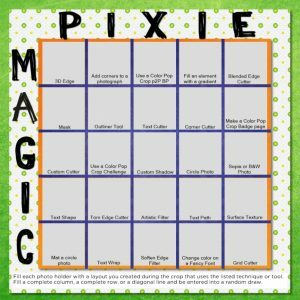 Every Pixie Magic Bingo Card posted to the pixels2Pages™ Community Facebook group or posted in the Games Collaborative Album will be entered into a random draw for a free digital art kit. Bingo pages must be posted before the crop ends on Sunday, February 10, 2019 at 8:00 pm Eastern. Click the image below to download your Bingo template. Your Bingo badge is included in the Badges album. At every p2P virtual crop, participants are encouraged to crop together as a team using a team hashtag and posting their pages in the pixels2Pages Community. At the end of the crop, a page is randomly selected and the person who created the page, along with their entire team, wins an exclusive Blueprint collection! This Blueprint collection is not available in the FOREVER Store and is not distributed in any other way. We wanted these Blueprints to reach a wider audience, but we still want them to be exclusive and a great win for a team. Starting with this virtual crop, crop participants will have the opportunity to win the featured exclusive Blueprint of the Day each day! There will be multiple winners every day. There are three Blueprints in the exclusive collection, so a different Blueprint will be raffled off on each day of the Crop. At the end of the crop, one lucky team will win all three Blueprints. Remember, it is easy to win and crop with a team. Just create a team hashtag and use that hashtag in the credits every time you post a page in the pixels2Pages Community. We always kick off the crop with an exclusive gift for our pixels2Pages™ members. 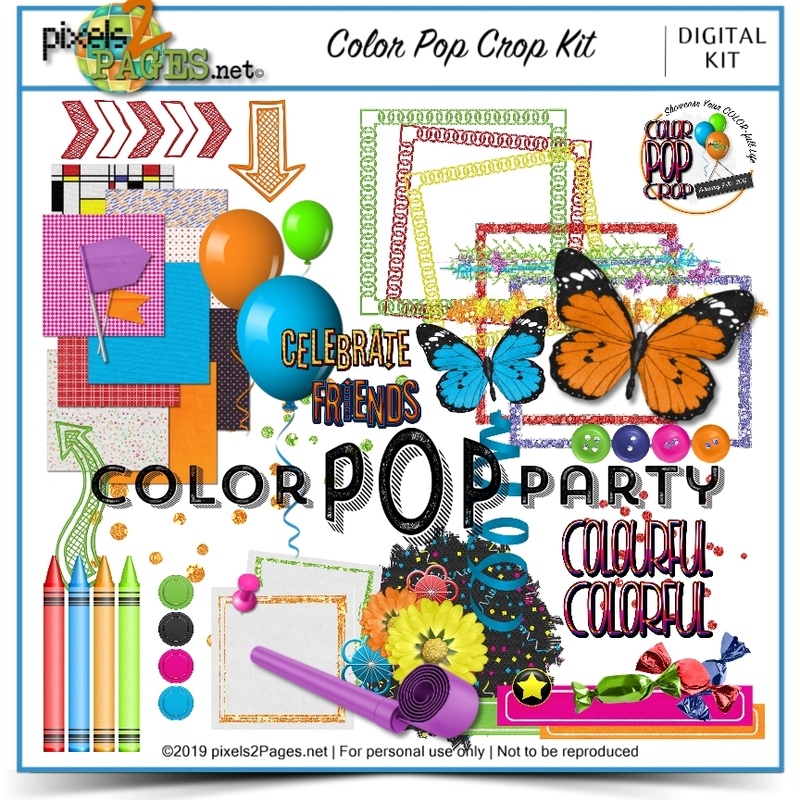 This Color Pop Crop Kit was created especially for you. The kit contains a large variety of elements that can be used on just about any type of page. It has the perfect mix of textured and patterned papers along with themed frames, masks, overlays, word art, tags and more. It also includes embellishments with spellings for US, CAN, AUS and NZ pixels2Pages™ members. Click the image below to go to a page with a direct download. We have not forgotten about our friends of pixels2Pages™! Even though you may not be a member at this time, we want you to join the fun. 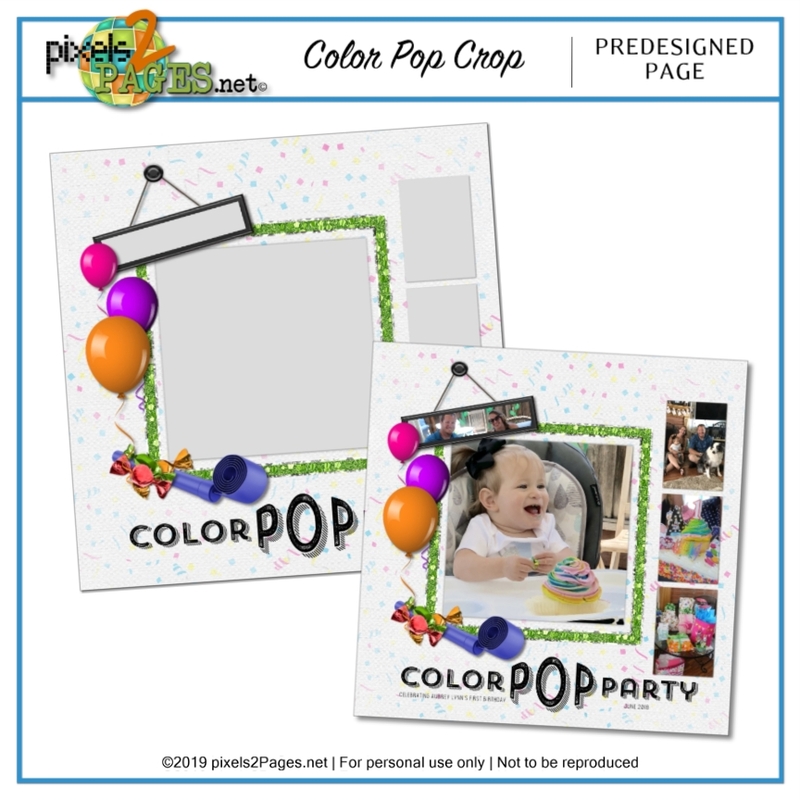 Click the image below to download a pre-designed page created using our Color Pop Crop Kit. Share your creations with us! Post your pages in the pixels2Pages Community Facebook Group and engage with the rest of the community. We encourage you to add your completed pages to our FOREVER Collaborative Album, even if you posted to the pixesl2Pages Community. 24 Responses to Welcome to the Color Pop Crop! I am trying to add my Pixie Magic game page to the collaborative album, but there is no separate nesting album for this game. I notice several people have added their PM page to the general album “Games”. Is that what we are supposed to do? Thank you! Add it to the Bingo folder. We have created the nested album. I just sent you a pm with the link. For the Bingo, can we use a page for more than one technique or tool? I have some with many techniques! As long as the technique has been used, you can use the badge. As long as the topic/technique is used, you can count the space. I have downloaded the page, but it is not showing up in my contents? Is there a problem with this page? All my other ColorPopCrop freebies and PB and purchases are down loaded and working. I think you are asking about the predesigned page. If so, that doesn’t show up in content – it is a template. Add a template from an art kit, find the kit, and then add it to your page. Is anyone else having trouble with the Bingo page? Once I load my photos in the Bingo squares and save it is hanging up my entire system and won’t actually save. I have to force Artisan to close. I’ve waited more than 10 minutes for it to save 4 squares. Any suggestions? It sounds like your project might be corrupt. Create a new project and import your existing pages (from the old project) into the new project. I’m running into the same issue. Have tried a couple of times to recreate. Was working a little better, but now cannot add to the card. Have tried .png and .jpg file types. Suggestions? Once you download the Bingo Blueprint, you will add it to an open project in Artisan. From the Home Ribbon, click on Template, add file from your computer. Browse to the location where you downloaded the Bingo BP. The BP needs to be out of the zipped file in order to import it. Once imported, you can add your images to the Bingo card. You do not need to be a friend – we don’t accept friend requests, because our albums are public already. But you do need the link to the collaborative album that was in the welcome post. I noticed that there is no LEAD Ambassador badge. Thanks! Oh my!! I am so sorry – fixing that now! Check back in a few minutes! Thanks for catching that! Can I make a badge page and send it as an attachment on an e-mail as I have done in the past? You’ll need to follow the instructions on the Welcome Post for how to submit your badge pages this time, Marie. Thanks! I had so much trouble submitting my badge page. I tried uploading it twice to the collaborative album but then couldn’t find it to send the URL. I did eventually realize that I could send it from my Forever account. What did I not understand??? I think the part you missed was this: You will need to share the link to your badge album from your FOREVER Badge album by clicking on the “Share Album” button and copying the link (do not simply copy the browser URL). It was not supposed to go to the collaborative album. Did you get it done successfully? It’s World Back Up Day! Make Sure Your Files Are In Order. Blog: What’s In Your Downloads Folder? News: p2P Week of Love is here.